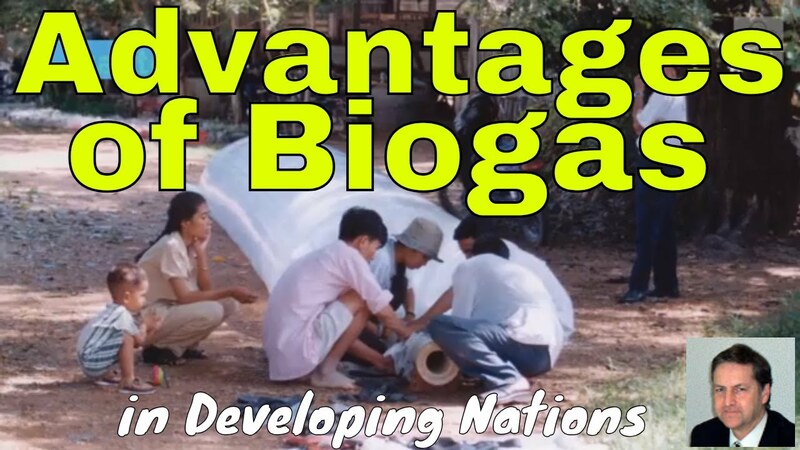 The advantages of biogas are many. Among the greatest advantages are that the renewable energy produced, substitutes fossil fuels and thus reduces the emissions of greenhouse gases. Plus, the anaerobic digestion process does it at a cost much lower than by most other techniques. In addition to the multiple renewable energy advantages of biogas are the soil fertilizer and soil improvement products that can be produced as a result of digesting organic waste and converting it to renewable energy. Perhaps the advantage we like best are the social advantages of biogas. These are major, including improving health by lessening indoor smoke inhalation when biogas is used for home cooking instead of firewood, reducing deforestation by lowering demand for firewood, and saving time collecting fuel-wood for women and children. - we all benefit from the resulting greenhouse gas (GHG) emission reduction. Watch this on the YouTube website here. Another The main advantage of biogas is that it is obtained from residues and wastes. That means it has the ability to transform waste material into a valuable resource. This matters greatly in the present conditions in which many countries are facing enormous problems associated with overproduction of organic wastes from industry, agriculture and households. The advantage of biogas which is seldom discussed is that it can be converted into electric energy through a relatively simple process. That is by using a reciprocating engine and a set of coils (known as an electrical generator). One can retrofit the ability to use it as the fuel easily to conventional combustion engines to be used for a new fuel. But, until the hydrogen sulphide is removed the problem of some pollutant emission does remain. Another advantage of biogas is that the technology which is used to produce biogas is quite a lot cheaper than from most other energy sources. And, on top of that is has the advantage of waste reduction capability and potential it presents to divert waste away from landfill. Also, biogas can be produced in all rural areas from readily available materials. Unlike other types of renewable energies, the process is natural, not requiring energy input for the generation process. Also, a major benefit of anaerobic digestion is the wide range of feedstocks a digester can receive and process. There is a big social benefit of anaerobic digestion which is creating or maintaining local job opportunities for skilled technicians, and the potential exists for the stimulation of new industries to maintain and service the biogas plants. We also so far have not mentioned that an advantage of biogas is the possible distribution via public grid to enable efficient energy utilization. Finally, another benefit of anaerobic digestion is that the energy that it recovers from the wastewater can often be used to generate heat and even electricity at the plant. It produces a bi-product known as digestate which can be used as organic fertilizer on arable crops.